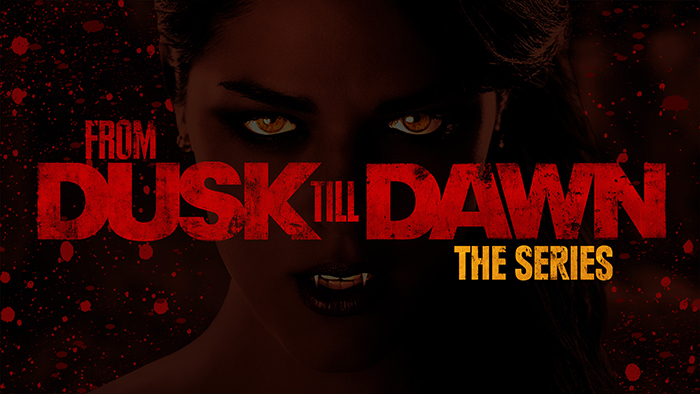 When it was announced that From Dusk Till Dawn was getting the episodic TV treatment, I was very hesitant to the news. I hold the original film in a very special regard. When I was just a young one, I was actually terrified of horror movies and anything related to the genre. It wasn’t until I was about 11 years old that I started becoming fascinated with the genre and got over my fear of it. Stephen King novels were very instrumental in this, as were three specific horror movies. Wes Craven’s original A Nightmare On Elm Street was traumatic to me as a youth, specifically Tina’s incredible death scene. I actually did not sleep for 3 whole nights after viewing that scene. The next film was the original Scream, as flawed as it may be. It showed me a different side to the genre, plus made me want to be just like Randy. Then there was Robert Rodriguez’s From Dusk Till Dawn. Never before had a film grabbed by my balls and thrown me against the wall. The violence! The language! The great acting. As I look back now, it is definitely not a perfect film, but due to the effect it had on an eleven year old Mister Gore, I hold it in a very high regard. So, back to the topic at hand. What made it seem like a good idea to turn it episodic? After all, despite the sequels, it was very close to being a one and done story. Most of the vampires were exterminated by the time the film ended, so where could they really go from there? My hopes were alleviated when it was announced that it would be a Netflix TV show, as the track record for Netflix shows has been stellar. Hell, Hemlock Grove was even decent for a few episodes despite turning into a train wreck about halfway through the season, and that was their worst show. The success of Arrested Development, House Of Cards and the fantastic Orange Is The New Black ensured that Netflix had a solid idea of how to manage a TV show. Then Robert Rodriguez was brought on. Now, I have a love/hate relationship with Mr. Rodriguez. The El Mariachi films are great, and I have spoken of my love for From Dusk Till Dawn. While many people regard his Planet Terror as the superior film in the Grindhouse double bill, my main issue is that it was far from a Grindhouse film at all. It was an ‘80s action horror romp disguised as a Grindhouse flick. Not that it was bad, but it wasn’t what it was supposed to be. So obviously it was with great hesitation that I viewed the Pilot episode of From Dusk Till Dawn. As I write this review I will be watching it a second time to refresh my thoughts and ensure that I give as fair and unbiased a review as possible. The interesting thing to me right from the start, is that the entire 40 minute episode takes place in the span of what took about 5-10 minutes in the original film. It does a good job of giving us flashbacks to what led the two Gecko brothers, Seth and Richie to this point. And it allows some expansion on all of the characters involved, many of whom were throwaway characters in the film, or did not exist at all. First things first, let’s talk about the casting of Seth and Richie Gecko. In the original film, Seth was played by George Clooney, possibly one of the best and most likeable guys in Hollywood. Obviously it was going to be quite difficult for young D.J. Cotrona to try and emulate Clooney, but based on this first episode, he seems to do a good job making the role his own going forward. I can’t comment at this point on if that will last, but I walked out of this episode with a good deal of hope for the young thespian. Then there is Richie, originally played by the mad man himself Quentin Tarantino. Let me say right away that I am not a ridiculously blinded fan of Tarantino like most people are, but I do have a level of respect for him. But he is definitely better behind the camera than he is in front of it. He played Richie as a little off kilter and did a fine job, but holy hell does Zane Holtz take it and run with it. Before he even opens his mouth you get a creepy vibe from him, and he completely makes you forget that this is a role played by a huge Hollywood heavyweight. The episode begins with a flashback to the origin of Santanico Pandemonium, originally played by Salma Hayek in possibly her sexiest role ever. Taking over the role is Eiza Gonzalez. Unfortunately, at least in this episode we don’t get a chance to see much of her. She is only seen in the brief flashback, and some visions that Richie has. We do also get the always awesome Don Johnson as Sherriff Earl McGraw, along with Jesse Garcia as Ranger Freddy Rodriguez. While Don Johnson is there to lend a bit of star power to the pilot, he does the most with his limited screen time, helping lend a bit of levity to the story arc that is going to help the young Ranger through the series. We do also get a brief appearance from Wilmer Valderrama as Carlos, the Gecko Brothers contact south of the border. While it is obviously hard to see him as anything other than Fez on That ‘70s Show, he does his best. How he will be remembered for the series will certainly come in further episodes, so it would be reckless to judge based on just this first episode. Overall, the show has potential, and it will be interesting to see how it progresses against the timeline of the film. Will it just expand on certain scenarios alongside the original timeline, or will it go further and change certain plot points. Netflix has changed their release schedule format with this show. Whereas before with any Netflix released show they would release a season in one big chunk for binge viewing, they have opted for the weekly release model with this show. As of this writing there are three episodes currently available, so over the next few days I will be trying to catch up with them and then reviewing the episodes weekly. Stay tuned fiends and ghouls.